Join us and experience one of our hiking tours in Wadi Rum! Our hikes will take you to some of Wadi Rum’s best-kept secrets and least-visited sites in addition to its top attractions. We know how to get far from the crowds, where all you will hear is the silence of the desert. All of our hiking trips begin around 8:30-9am (or as soon as you arrive at the Wadi Rum Visitor’s Center). We will first take you to our family house for tea, and if there’s time before departure we’ll show you to Shalala Spring, 20 minute hike away, or the Nabatean Temple at the foot of Jebel Rum, just a ten-minute walk from our house. Also before leaving, we will take a look at the map to discuss our routes, which are sometimes flexible according to your own tastes. Our tours include meals, plenty of water, tea, English-speaking guides and sleeping equipment for overnight trips. Torch, camera, hiking shoes, warm clothing in winter, sleeping bag (optional for overnight trips), sunscreen and a good hat. Since summer months receive more daylight hours, we are still able to visit the all the attractions listed in your tour. On tours lasting more than one night, visitors can choose to spend one night in the open desert in addition to the night spent in our camp. This full-day hike includes a climb of Wadi Rum’s tallest dunes and walks through several spectacular canyons. Lunch and water are included. 8:30-9:00 Set off on foot towards Lawrence’s Spring. 9:00 Arrive Lawrence’s Spring, water hole used since Nabatean times. 10:30 Arrive at Khazali Canyon, 20-meter siq etched with Nabatean iriptions. 12:00 Lawrence’s House, ancient caravan stopping point. 12:30 Lunch and rest in shady spot. 3:30 Arrive at Anfishiyeh inscriptions. 4:30 Arrive at Wadi Rum’s largest sand dunes: 5min climb, 5sec descent. 6:00 Arrive in Wadi Rum Village. Children under 10years old free, and under 15 years old there is a discount of 50%. 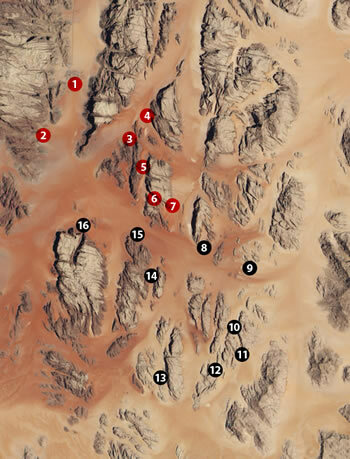 This hike takes you deeper into Wadi Rum than our 1 day Hike. You will reach all the way south to the picturesque Umm Fruth Rock Bridge and pass through the spectacular Geber Amra Canyon. You will spend the night under the stars or in a private tent in our beautiful campsite beneath Jebel Araqqa. 9:30 Lawrence’s Spring, a water hole used since Nabatean times. 10:30 Khazali Canyon. Hike the siq, etched with Nabatean inscriptions. 12:30 Lunch and rest in Geber Amra Canyon. 4:00 Umm Fruth Rock Bridge. Enjoy 5 minute climb. 5:00 Pass narrow Abu Khashaba Canyon. 5:30 Arrive at camp. Relaxing time, dinner, sleep in tents or under the stars. 9:00 Arrive at Lawrence’s House, ancient caravan stopping point. 10:30 Anfishiyeh’s Nabatean inscriptions (300BC). 11:00 Wadi Rum’s largest sand dunes. 5 minute climb, 5 second descent. 12:30 Arrive in Wadi Rum Village. Children under 10 years old for free, under 15 years old 50%. This two-day hike lets you explore further to the south, including Burdah Canyon, Khazali Canyon and Korj Canyon. We will also climb Wadi Rum’s tallest dunes, see several rock bridges and visit ancient Nabatean sites. All meals are included, as well as a night spent in our Jebel Araqqa campsite, either in a tent or under the stars. 9:00 Set off from Wadi Rum Village towards Lawrence’s Spring. 10:00 Lawrence’s Spring, a water hole used since Nabatean times. 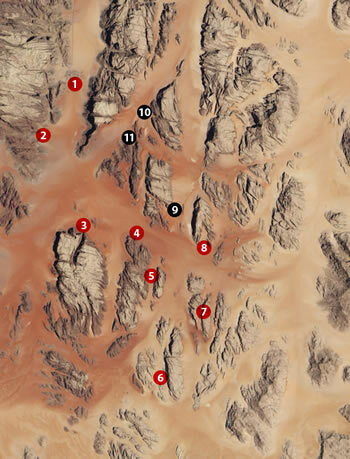 11:00 Reach Wadi Rum’s highest sand dunes. 5min climb, 5sec descent. 12:00 Lunch in Umm Rashid Canyon. 3:30 Pass through the narrow Korj Canyon. 4:00 Lawrence’s House, ancient caravan stopping point. 5:00 Arrive at our beautiful camp site. Relaxing time, dinner, sleep in tents or under the stars. 8-9am Breakfast and depart on foot towards Mushroom Stone. 10:30 Pass through Shayib Canyon. 11:00 View of Burdah Rock Bridge. 12:00 Lunch in shade of Burdah Canyon. 3:30 Umm Fruth Rock Bridge. 5min climb to the top. 4:00 Pass through Geber Amra Cayon. 5:00 Khazali Canyon. Enter to see Nabatean inscriptions. 6:00 Arrive back in Wadi Rum village. Children under 10 years old for free, and under 15years old 50%. This tour also takes you far from the crowds, to the stunning Barra Canyon, one of our absolute favorite spots also Pass through more narrow Canyons. You will have the choice between spending the second night in our well-equipped camp or in the open desert. You will have a good experience about the Desert in the end of this one. 8:00 Introduce your guide and give the basic instructions for camel riding. Within about 15min we should be ready to mount and set off. 9:00 Lawrence’s Spring, a water hole that has been used since Nabatean times. 11:00 Anfishiyeh’s Nabatean inscriptions (300BC). 5:00 Reach our beautiful camp site beneath Jebel Arraqa. Free to relax or explore on foot. Dinner in our large Bedouin tent. Sleep in private tents or under the stars. 11:00 Pass through the narrow Barra Canyon, one of the most spectacular spots in all of Wadi Rum. 12:00 Lunch in the shade at the end of Barra Canyon. 3:00 Views of Abu Jdeidah open up to the east. 5:00 Arrive at Mushroom Stone. 6pm Arrive in our beautiful camp site. Dinner, relaxing time and sleeping in private tents or under the stars. 10:00 Burdah Arch, Wadi Rum’s largest rock bridge near the top of Jebel Burdah. 3:00 Umm Fruth Rock Bridge. Enjoy 5 minute climb. 4:30 Small Arch. Climbing takes only a minute. 5:30 Khazali Canyon, enter the 20 meter siq etched with Nabatean inscriptions. 6:30 Arrive in Wadi Rum Village to end the tour. Children under 10y ears old for free, under 15 years old 50%. Not for the faint of heart, this hiking tour takes you far into the wild south, including walks through the stunning Barra Canyon and the base of Jebel Burdah where Rum’s largest rock arch is perched. Weather permitting, you can enjoy your nights under the stars while spending your final night in our lovely campsite. If you wish to climb to the Burdah Arch we can also fit this into your hike. Note that for the accompanying guide, this climb will take 3hrs and it will be an additional cost (40JD/30JD/25JD for 1pax/2-3pax/4+pax). 9:00 Depart from Wadi Rum Village. 3:00 Natural caves. 30 second scramble. 5:00 Camp in desert beneath rock outcropping. Dinner and sleep under the stars. 7:30 – 9 Breakfast and departure. 10:00 Bedouin cisterns carved in the mountains. 7:00 Camp in desert beneath Burdah Arch. Dinner and sleep under the stars. 10:00 View of Al-Hudhn Valley. 2:00 Lunch beneath Jebel Muharrag. 4:00 Pass through narrow Barra Canyon. 5:00 View of Mzeilgeh Valley. 6:00 Arrive in our beautiful campsite beneath Jebel Arraqa. Dinner and sleep in tents or under the stars. 10:00 Lawrence’s House, ancient caravan stopping point. 12:00 Wadi Rum’s largest sand dunes. 5 minute climb, 5 second descent. 1:00 Pass through Umm Rashid Canyon. 2:00 Small Arch. Lunch in shady spot nearby. 4:00 Khazali Canyon. Hike the small siq with Nabatean inscriptions. 5:00 Arrive in Wadi Rum village. Take a shower! An extension of the 4-day tour, this epic tour adds the vast Wadi Sabet near the Saudi border as well as Jordan’s highest peak, Umm Adami (1800m), which you may climb if you like. On the return trip we pass through the stunning Barra Canyon and camp at the base of Jebel Burdah, which you may also summit. Weather permitting, you can enjoy your nights under the stars while spending your last night in our beautiful Bedouin camp. If you wish to climb to the Burdah Arch we can also fit this 3hr hike into your trip (for the accompanying guide, this will be an additional 40JD/30JD/25JD for 1pax/2-3pax/4+pax). If you wish to climb to the top of Umm Adami, the will take about 3-4hrs (and an additional 45JD/35JD/30JD for 1pax/2-3pax/4+pax for the accompanying guide). 9:30 Depart on foot for Larence’s Spring. 10:30 Lawrence’s Spring, a water hole used since Nabatean times. 12:00 Qatar Spring, beneath spires of Jebel Qatar. 2:30 Umm Al-Samn Arch. Lunch in shady spot nearby. 6:00 Camp in desert beneath rock outcropping. Dinner and sleep under the stars. 7:30 – 9:00 Breakfast and departure. 9:30 Bedouin cisterns carved in the mountains. 11:00 Views of Umm Al-Samn and Jebel Al-Waraga. 2:00 Lunch in shady spot. 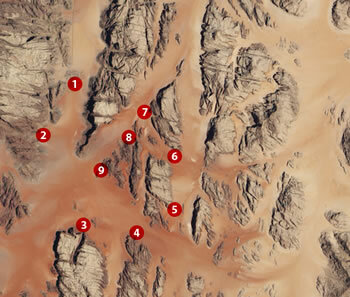 6:00 Arrive at base of Umm Adami, Jordan’s highest point. Set up camp, dinner and sleep under the stars. 2:30 Umm Fruth Rock Bridge. Lunch nearby. 6:00 Camp in desert beneath Burdah Arch. Dinner and sleep under the stars. 10:30 View of Al-Hudhn Valley. 3:00 Lunch beneath Jebel Muharrag. 4:30 Pass through narrow Barra Canyon. 5:30 View of Mzeilgeh Valley. 6:30 Arrive in our beautiful campsite beneath Jebel Arraqa, equipped with bathroom and shower. Dinner and sleep in tents or under the stars. 2:30 Small Arch. Lunch in shady spot nearby. 5:00 Arrive in Wadi Rum village. Celebrate! Children under 10 years old for free and under 15 years old 50%.